If you are worried that using a co-signer will lock them in on your student loans you don’t need to worry. 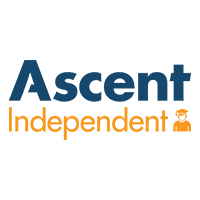 With Ascent Tuition, they offer the ability for a co-signer release after just 24 months of consecutive payments. 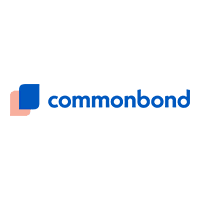 When you get a loan with Ascent Tutiton, they offer the borrower a few unique options for paying back their loans including; interest-only, deferred payment and $25 minimum payment. Check out their disclaimer for more info. When working with Ascent using their Tuition loan, they offer no fee which includes the following; No origination, disbursement, or loan application fees. Also, when you enroll in auto pay you get a %.25 discount toward your monthly payment. Welcome to Ascent student loans. 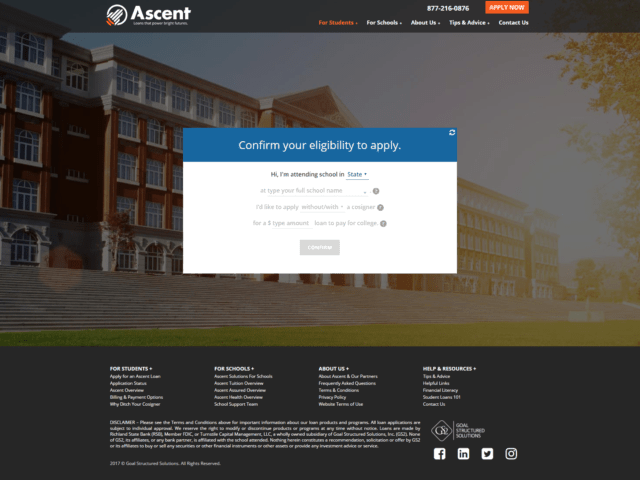 Ascent offers two great private student loan options to help you go to college for the first time or allow you to finish out your last couple of semesters. On this page we will be breaking down the Ascent Tuition private student loan product they offer. Tuition is a private student loan which requires the use of a cosigner. This loan is essentially designed with your family in mind and makes it easy for almost anyone to be able to acquire a loan from Ascent assuming you meet the minimum requirements which we will touch on later along with your cosigner. With this in mind, Ascent allows for you to essentially customize your loan to fit your needs. Ascent Tuition offers competitive rates for both fixed and variable interest rates for their loans. 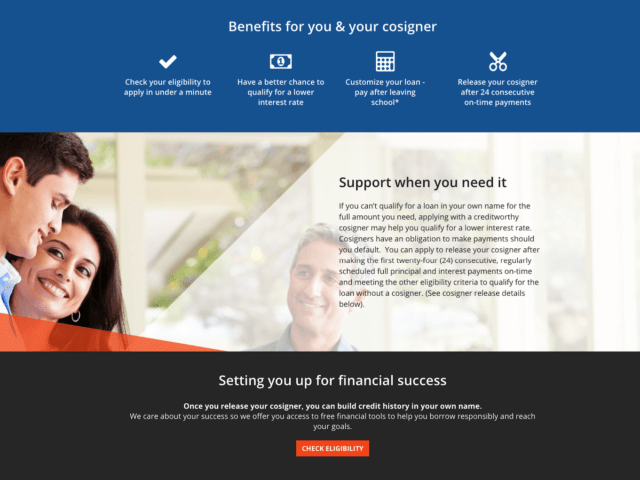 They also offer a cosigner release after 24 months of consecutive payments on your loans. 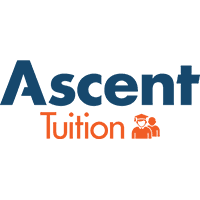 Ascent Tuition has one of the lowest loan minimums of just $2000.00 and goes all the way up to $200,000.00 (aggregate) if needed. They also provide you with flexible repayment terms of 5, 12, or 15-year repayment options (Variable rates are not offered at the 15-year term). They also offer unique repayment options they you may not find with other private student loan lenders. One option they offer is In-School interest-only payments. This means that you will only pay for interest while you are in school, then start paying the interest + principle after you have completed school. The other option they have is Deferred Repayment, which allows you to defer payments up to 6 months after leaving school. Finally, Ascent now offers 1% Cash Back Graduation Reward upon satisfaction of certain terms and conditions. 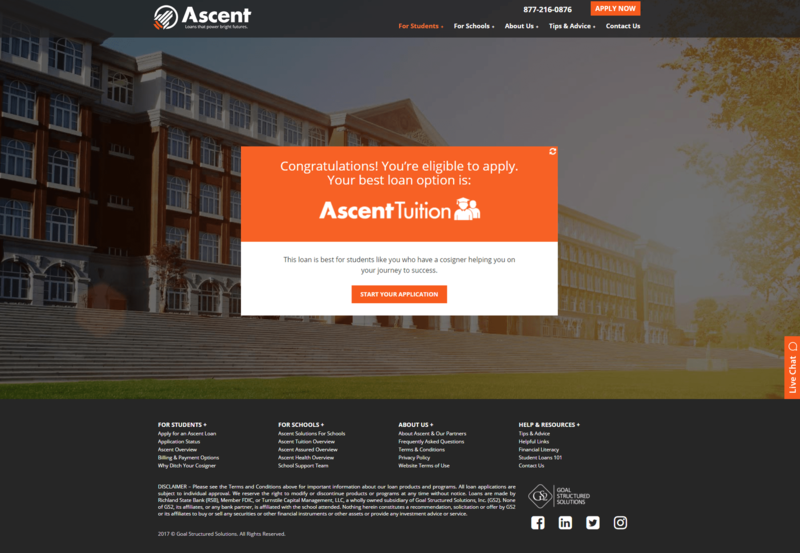 If you are curious what a repayment option would look like, check out this super helpful link they offer: Ascent Tuition. As you can see from some of the highlighted information above, Ascent really does stand out when it comes to private student loans. They have some key features which may sway you in the direction of taking out a loan with them items such as; auto pay discount when using automatic debit, no origination, disbursement 0r loan application fees just to name a few of the many outstanding features they offer. Are you ready to see how Ascent Tuition can help you win with your student loans? Head over to their Eligibility Wizard to see if you qualify. With an average completion time in under 1 minute, what do you have to lose?